Information about moose hunting in Alaska including cost, hunting techniques, calling, judging, outfitter operations, gear lists and more. Our moose hunts begin with a bush plane flight into a remote area of Alaska . The moose hunting season is in September when the moose are moving into their fall grounds and getting into the rut. By observing seasonal migrations year after year one is able to predict Moose behavior and movement to a great degree. Terrain features such as ridges and ponds sometimes create natural “funnels” where traveling moose will be concentrated. Known areas with ideal browse, water and seclusion draw large bulls and their harems each year. Moose are very vocal and use grunts, moans and brush-raking combined with their exceptional hearing to locate one another from great distances. They respond well to calling and can be called from miles away. A bull moose's antlers and ears act as a parabolic microphone. Sound waves are bounced off the large dished palms of the antlers and directed into the ears. Different calling techniques are effective at different times during the rut. Early in the rut and during the pre-rut bulls often pair up and form small bachelor groups. As the rut progresses they start seeking cows and become more combative. The biggest bulls will collect and defend multiple cows and will then become less responsive to calling. However, big bulls with cows can be approached and effectively hunted as long as you “speak the language”. This type of hunting often results in close encounters. Calling moose in the right conditions can bring them in right on top of you. Though big older bulls tend to be more reserved when coming to calls, some can get downright belligerent. Expect to hunt mostly on foot as the areas we hunt for moose are inaccessible by other modes of transportation and have restrictions preventing the use of motorized ATV’s or boats. These remote "controlled use areas” are home to some of the healthiest moose populations in Alaska. Though most are backpack hunts, we also use rafts to conduct float trips as well as hunt from comfortable base camps. We use a combination of techniques including both spot-and-stalk and calling. We often use spike camps where elevation and terrain provide good visibility of the surrounding area. From these places you will hear their nightly mating carrying-ons, and be able to spot moose from your sleeping bag when you awake in the morning. On a typical day of glassing it is not uncommon to see a dozen or more moose. Hunters often pass on one or more mature bulls before harvesting a trophy moose. 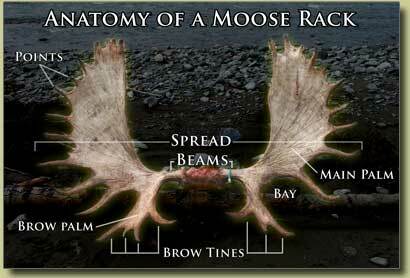 Although antler spread is the most common measure of size, it is only one of many factors to be considered. It is not necessary to buy lots of new expensive gear for your moose hunting trip to Alaska. However, it doesn’t pay to scrimp on some things. A few pairs of good socks might add more to the enjoyment of your hunt than a new rifle. I would prefer to see someone come with their trusty 30/06 that he has carried for many seasons rather than a brand new .338 that he is not familiar with. Other items that deserve consideration include boots, sleeping bag, and rain gear. Check out the Alaska Hunting Gear and Equipment List for a complete list of what gear to bring on your moose hunt. The most important thing you can do to increase your enjoyment and improve your chances of success is to be as physically fit as possible. However, we can accommodate most people with physical problems. Please give us a good assessment of your physical abilities and handicaps or medical problems, if any so that we can plan your trip accordingly. How Much Does it cost for a moose hunt? 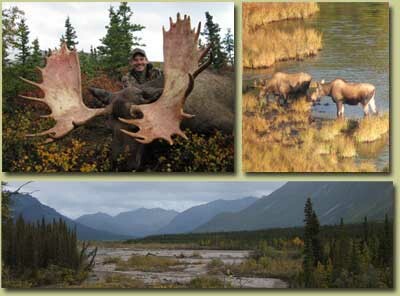 The price of a fully outfitted, 10 day guided moose hunt is $17,000. For more information on rates, deposits and Combo hunt prices, check out the hunt prices page. Moose hunting season is from September 1st to September 25th. The moose are rutting during this time. For available bookings, questions about our operation, or to request a reference list please Contact Alaska Adventure Outfitters. We encourage you to compare us with other moose outfitters.